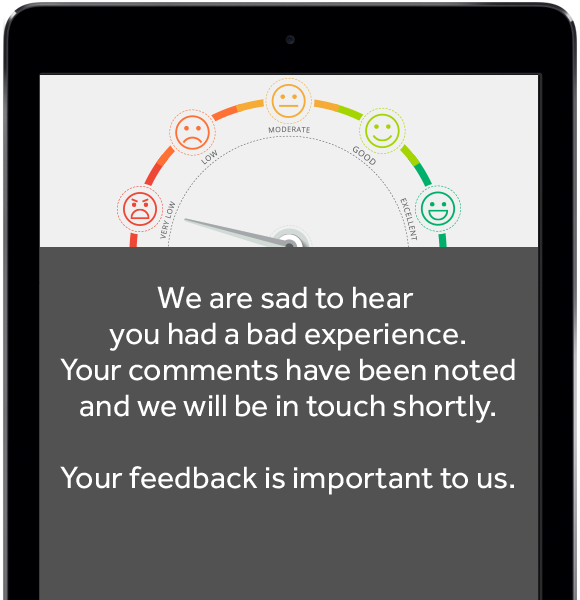 Create your survey in less than ten minutes without the need for technical knowledge. Follow the steps and fill in the blanks. Customers with great reviews are sent to a page that encourages them to share it. Otherwise they’re directed to contact your staff. Helpful video tutorials guide you through each page of the wizard and answer your questions. No guesswork needed. No more writer’s block. Choose from 4 preset questions to populate your surveys. Or simply write your own questions. Get valuable insights delivered to relevant team members without lifting a finger. For example, if a survey contained the word “food”, you could automatically forward the feedback to the head chef. Find all your feedback, metrics and stats in one place. No more survey responses getting lost or buried in your inbox. 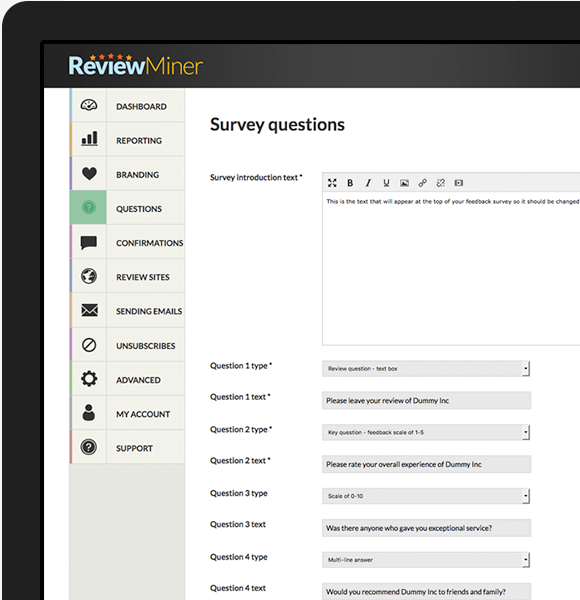 Create your survey, paste the link into your autoresponder, or email from within your dashboard, and let ReviewMiner™ do the rest. Add retargeting pixels or Google Analytics to your thank you pages. Build a custom audience for Facebook and unlock huge marketing potential among your real fans. Create a professional and seamless design in two minutes without a programmer or graphic artist. With a few clicks, you’ll have a professional survey that matches your brand image. Upload your company logo and select the colour scheme that matches your website. You can choose from preset colour themes or select your own palette for the text, background, header and links. Next, set up your questions. Choose between 4 preset questions or write your own. These are the questions that prompt customers to write great things about your products and services. The shorter the survey, the more responses you’ll get. Some negative feedback is unavoidable. However, using Review Miner you have the power to manage 1 and 2-star responses effectively. Your customers are sent to two different thank you pages depending on their level of satisfaction. Here you’ll tweak the text that appears on those pages. Choose the social sites that you want your reviews to appear on. Our specially-designed pages help you get great reviews spread across Facebook, Google+, TripAdvisor and more. Lastly, step 5 is about getting your survey in front of customers. You have two options here. One way is to paste your special Review Miner link into emails or autoresponders. Or alternatively, paste in your customer email addresses and have Review Miner send out the emails for you. In 10 minutes or less you can have ReviewMiner™ ready to help your business collect, manage and share reviews on autopilot. With better reviews online, you’ll boost your search rank, earn free advertising and attract more customers. Start your 30 day trial of ReviewMiner™ now and see the difference for yourself.